It’s the middle of July which means football is closer than you think. Training camps are popping up all over the country and fans will get their first glimpses of the 2018 iteration of their respective teams. 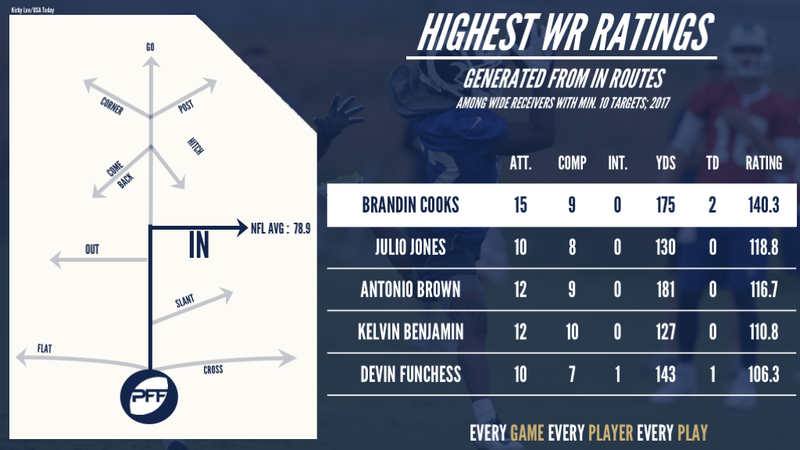 The middle of July means we also continue our look at the top wide receivers on each branch of the route tree from 2017, with an eye towards their possible success in the season to come. 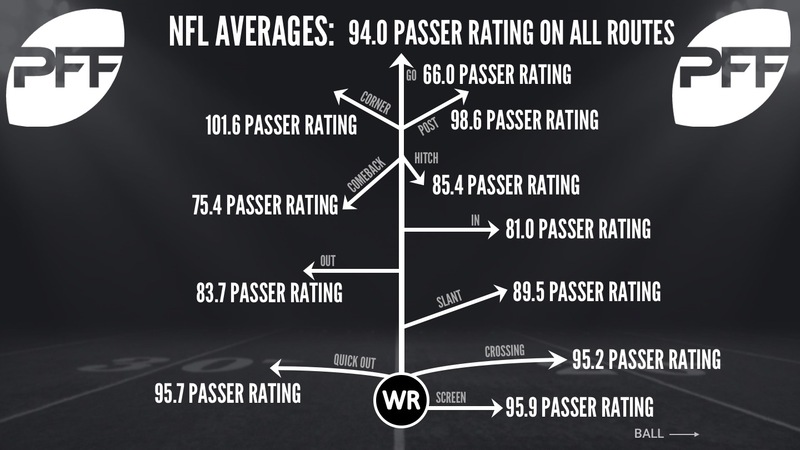 Over the course of July, we’ll take a look at the top five receivers from the 2017 season on each individual route, by their passer rating when targeted – their WR Rating – on each specific branch of the route tree. We’ve already looked at routes targeted at or behind the line of scrimmage, on slants, crossing routes, out routes and today continue that trek past the line of scrimmage. Judging by his recent contract extension, the Rams are excited about what the dynamic pass-catcher can bring to Sean McVay’s offense, and rightly so. The fifth-year receiver doesn’t just bring the lightning straight-line speed required to dominate on the deeper routes of the route tree, but he also possesses the athleticism to dominate on shorter routes. One example of this, was his performance on in routes last season, where he caught 9-of-15 targets for 175 receiving yards, which was the third-most behind just Keenan Allen and Antonio Brown. All told, he generated a passer rating of 140.3 from his in routes, which not only paced the league last year, but was the fifth-best mark ever recorded by PFF on in routes for a given season. It’s no surprise to see Jones near the top of this list as over recent years, no wide receiver has been more dominant on in-breaking routes. Since 2013, Jones is our highest-graded receiver on routes that break towards the middle of the field and he has tallied the most receiving yards (3,513), the second-most receptions (232) and the most first-down conversations (164) among receivers on in-breaking routes in that span. Looking just at his production on specific in routes in 2017, we can see that he hauled in 8-of-10 targets for 130 receiving yards and a passer rating of 118.8 when targeted. Jones has now placed in the top five among receivers with at least 10 in route targets in each of the last three campaigns. Business sure was boomin’ for Brown last year and he ended the campaign with an elite overall grade of 93.7, the best mark in the league. Throughout the year, the in route was a lethal weapon in his arsenal and he used it to haul in 9-of-12 targets for 181 receiving yards. His eight receptions that resulted in a first down ranked second among the league’s pass-catchers and 66.7 percent of his targets were positively graded, which was good enough for fourth. 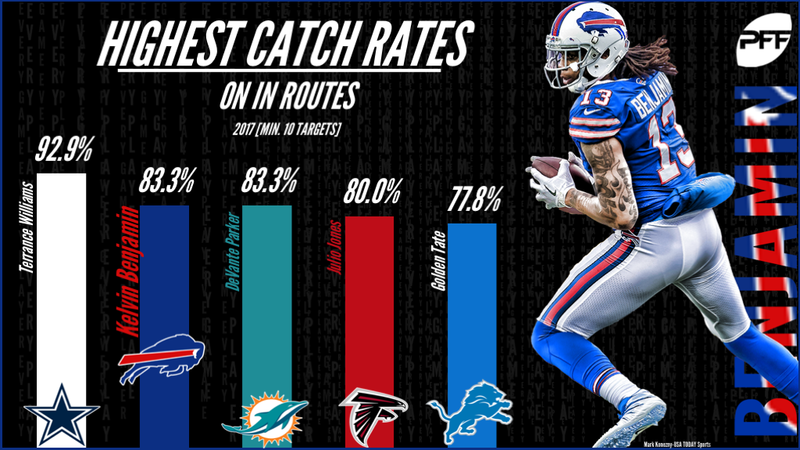 Heading into his first full season in Buffalo, there is a lot for Bills fans to be hopeful about and one of those things is his performance on in routes. For the second straight season, the in route was Benjamin’s most productive route and he ended the year with 10 catches from 12 targets for 127 receiving yards. All told, he caught 83.3 percent of the passes thrown his way on the route, which ranked second among receivers with at least 10 targets. The third-year wide receiver did a solid job as the team’s No. 1 option last year as saw 109 targets throughout the year, the most among Panthers receivers. 10 of those targets were on in routes, where he hauled in seven of those passes for 143 yards and one touchdown. Over the course of the year, Funchess was our second-highest graded receiver on in routes and he converted five of his seven receptions into first downs.